Derrick Walton Jr. filled Trey Burke's shoes like an upperclassman in East Lansing. No one saw this coming a week ago. Michigan was unranked and facing one of the toughest stretches in school history — three straight games against top-10 teams with two of them on the road. 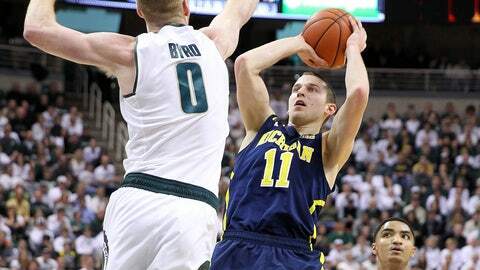 Trey Burke and Tim Hardaway Jr. were in the NBA and Mitch McGary was sitting on the bench in a suit. An 0-3 stretch seemed plausible, but not even John Beilein could have dreamed that the Wolverines would win all three games, finishing the streak with a 80-75 victory Saturday at the Breslin Center. How unlikely was it? No team had beaten three straight top-10 teams in the regular season since Iowa did it in 1987. "Everyone kept asking me about this week, and I kept telling them that I didn’t even want to look at it," Beilein said on his post-game radio show. "We knew it was going to be tough, but we stayed focused on one game at a time, not all three of them. Looking back on it, though, it really shows you that we are capable of playing very well at times. It’s certainly not easy to beat those three teams back-to-back-to-back." While Beilein reluctantly acknowledged that he would take a little time to enjoy the win before focusing on Purdue, Michigan State coach Tom Izzo wasn’t trying to hide his emotions at all. When a reporter said that he had to be disappointed with the loss, Izzo immediately said the proper word was "crushed." "The better team won the game," Izzo said. "They made the plays down the stretch. I want our kids to get stronger from this. I want them to hate losing and realize they hate losing to their rivals." In the first half, the Wolverines looked rattled by the Izzone and uncomfortable against Michigan State’s constant lineup rotation. Even with post players Adreian Payne and Branden Dawson sidelined, Izzo used 10 players in the first half, keeping Michigan off-balance as he switched from small lineups to big ones. That helped the Spartans to a 36-30 halftime lead, but the young Wolverines grew up in the next 20 minutes. Nik Stauskas kept knocking down 3-pointers every time the Spartans gave him a little room, while fellow sophomore Caris LeVert added 17 points and eight rebounds. 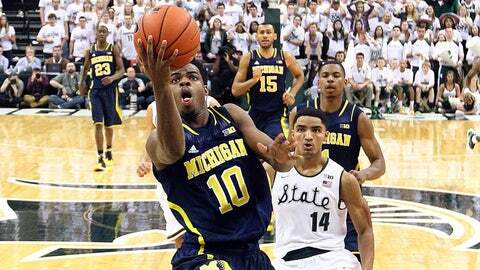 But it was freshman point guard Derrick Walton Jr. who gave the most mature performance. He missed much of Wednesday’s win over Iowa with flu-like symptoms, but he filled Burke’s shoes like an upperclassman in East Lansing. He finished with a career-high 19 points, five rebounds, four assists and only one turnover. More importantly, despite coming into the game shooting just 69 percent from the line, he hit nine of 10 free throws down the stretch to clinch the game. "I know my teammates are counting on me to make those shots," said Walton, who outscored Michigan State point guard Keith Appling by nine points. "You have to be able to make plays to win these games. I knew I was going to be matched up with Keith, and he’s a senior, so I knew I had to play like a veteran." Walton said that, despite all of the freshmen and sophomores, the Wolverines weren’t nervous going into their arch-rival’s building. "We don’t get rattled," he said. "We knew they have great players, and we knew they were going to keep coming after us, but we kept our composure. You have to keep your poise to beat those guys. I know a lot of them, and we’ve joked back and forth with a lot of trash talk, but this is a huge win." If Walton took over for Burke, it was Jordan Morgan and Jon Horford who stepped up in McGary’s place. As usual, they didn’t do anything spectacular, but at the end of the night, they had 10 points, nine points and most of the team’s veteran leadership. "We knew this was going to be a battle," said Morgan, one of the few Wolverines who had won a game at the Breslin Center. "It is never going to be easy to win here." Morgan scored only four points, spending much of the night in foul trouble, but Beilein insisted he was a key to the victory. "Jordan has been knocked down in this building before, and he’s been punched in the mouth here," he said. "He understands what it takes to win in this place, and when he got knocked down again tonight, he got right back up. That showed our guys something." Morgan and LeVert and Walton were only able to make a difference because Stauskas battled Michigan State’s Gary Harris to a draw. They spent most of the game guarding each other, but it was their offensive duel that lit up the scoreboard. Between them, they scored 46 points on 28 shots, including 9-of-12 3-pointers. Harris came out ahead in the scoring matchup, finishing with 27 points, and impressing his coach. "If Gary Harris isn’t the best player in this league on both ends of the floor, then God bless whoever is," Izzo said. At the end of the night, though, it was Stauskas blowing kisses to an unhappy crowd, and it was the Wolverines in first place after one of the best weeks in school history.